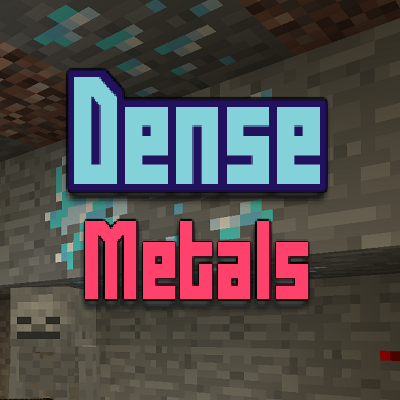 An utility mod, that adds dense ores for the different types of ores. Each ore spawns next to its counterpart ore, for example dense iron ores will spawn around Iron Ore clusters. Each dense ores is fully configurable and can be disabled fron the config file provided. Dende ores have a probablity of 1 to 3 drops per block. Fully configurable from the config file + MMD OreSpawn Integration. Are these dense ores registered in the Forge OreDictionary? Would it be possible to see support for the silver ore in Ice and Fire? are there any mods this is compatible with? if so which? I think Knox has added compatibility for Base Metals, Modern Metals, Nether Metals and End Metals but I'm not 100% certain. This might be a tall order, but could you possibly support Ore Stone Variants? Or would that be on their end? Or maybe there just isn't enough interest and you'll focus on more pressing things? It'd be amazing if you could do it, but I completely understand if you can't and/or don't want to. You will need to ask them since that mod is not open source, I cant access its Blocks classes for me to be able to support it. Could we possibly see compat with misty world, too? Check your config file and make sure that the other ores are enabled for Dense ore support and worldgen. Any plan on adding a property to set chance and vein sizes in the config? And a way to create custom ores (I mean, I have my modded ore Vulcanite, there's a way I can create a dense vulcanite ore)? Is it possible for you to backport this into v1.11.2?